Photo by Andrew Goff There's a whale… in the river! Photo by Andrew Goff Combined noisy efforts from the Yurok Tribe, NOAA and HSU attempt to make the river uninviting to mama. Photo by Andrew Goff A Crescent City fireboat attempts to convince mama this isn't her home. Photo by Andrew Goff The gray whale calf stayed close to its mother for several weeks before heading out to sea late last week. Photo by Andrew Goff Whale profiteering! Photo by Andrew Goff Photographer Alan Justice peddles whale imagery. Photo by Andrew Goff Jiachen Zhao of San Jose plays whale poohsticks. Photo by Andrew Goff Consensus: Whales are cuter in pairs. Photo by Andrew Goff The gray whales chose a convenient location to be cute in. 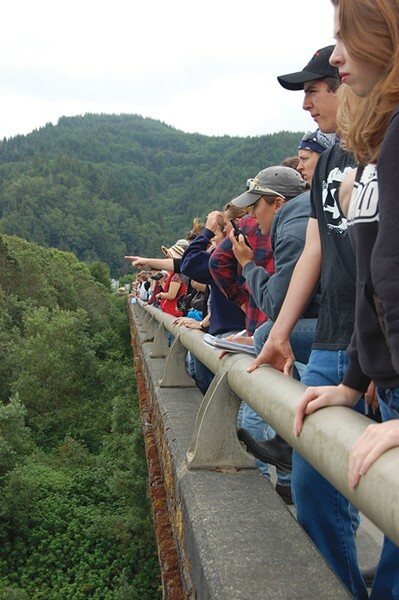 Photo by Andrew Goff Safety concerns on the bridge prompted heavy monitoring by the Yurok Tribal Police. Photo by Andrew Goff When a whale crossed below, people crossed above. Photo by Matt Mais. 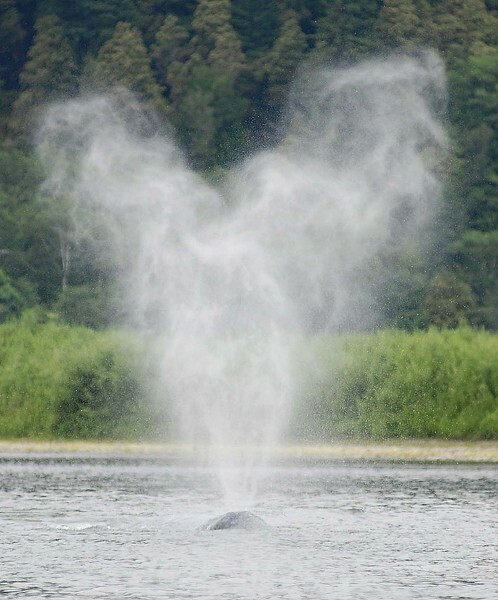 Gray whales have two blowholes that produce a distinctive heart-shaped spray. 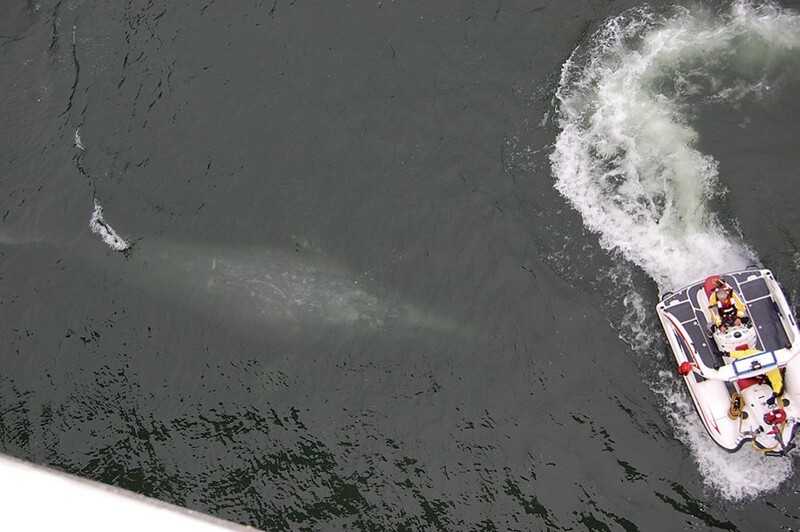 Photo by Andrew Goff Student researchers communicated the whale's position to teams in boats below via walkie-talkie. Photo by Andrew Goff Looking up river. She wasn’t getting the message. Two miles upstream from the mouth of the Klamath River and surrounded by boats, the mottled 45-foot female gray whale lurched slowly through the waters, in between and sometimes beneath her human agitators. The people on the boats surrounding her used hammers to rhythmically clang long steel poles dipped into the water. A Crescent City Fire Department boat fired a strong stream of water from its hose at her. Power boats and jet skis spun confrontational donuts in front of her. Occasionally, the cacophony produced by the well-intentioned pipe-bangers coalesced into a synced metallic pulse. Almost musical. Mostly annoying. But that was the point. The horrendous sounds and posturing -- conducted intermittently last Sunday for about nine hours by a team of biologists, observers and others from the National Oceanic and Atmospheric Administration, the Yurok Tribe and Humboldt State University -- were supposed to make the river uninviting to the cetacean and entice her to swim back downstream to the Pacific Ocean. Up until Friday, the whale had been accompanied by her 5- to 8-month-old-calf -- the two were inseparable during the first three weeks after they were discovered in the river on June 23. Then, earlier last week, the calf began making forays away from its mother -- once it traveled a mile upstream from her before returning. On Saturday afternoon it disappeared. That evening, observers on the coast saw a small whale hugging the coastline that they strongly believed to be the calf. Happy ending, 50 percent realized. At least for now. Scientists wanted to chase the whales back to the ocean for a number of reasons. Water levels would be dropping as the summer progressed -- the river could get shallow enough to prevent the whales' exit. As well, the toxic algal bloom that plagues the river each summer and fall might pose a threat to the whales' health. And while the whales could tolerate fresh water, any prolonged duration in it was bad for their skin and also could cause internal issues. But the biggest health worry was food -- it was scarce in the river, and the baby appeared to be losing weight. In addition to health concerns, the Yurok Tribe’s commercial fishing season was set to begin July 31. That would bring a swarm of boats into the river, which could pose danger to boater and whale alike. The gill nets that Yurok fishermen use to capture salmon at the mouth of the river could entangle the whales -- or be destroyed by the whales if they did swim through. But Sunday’s attempts to coax mom out -- the clanging, the spraying, the donuts -- weren’t working. In fact, the swimming location, pattern and speed the whale jointly executed with her calf earlier in the week hadn't changed. Was she ignoring her provocateurs? Oblivious? Willfully defiant? Whatever it was, it made for suspenseful theater. And in such an accommodating location! 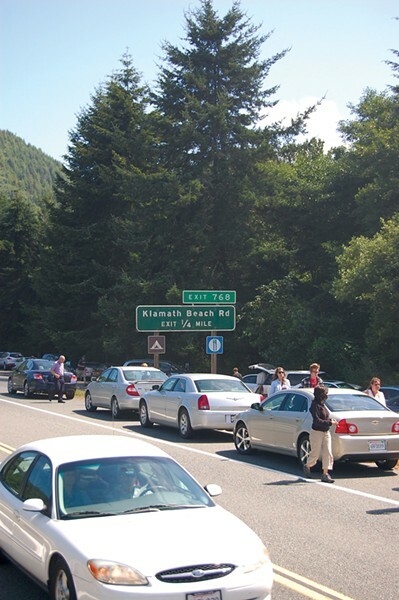 Conveniently for summer motorists in need of leg stretch time, the whale had decided to take up temporary residence where the river was crossed overhead by busy Highway 101. 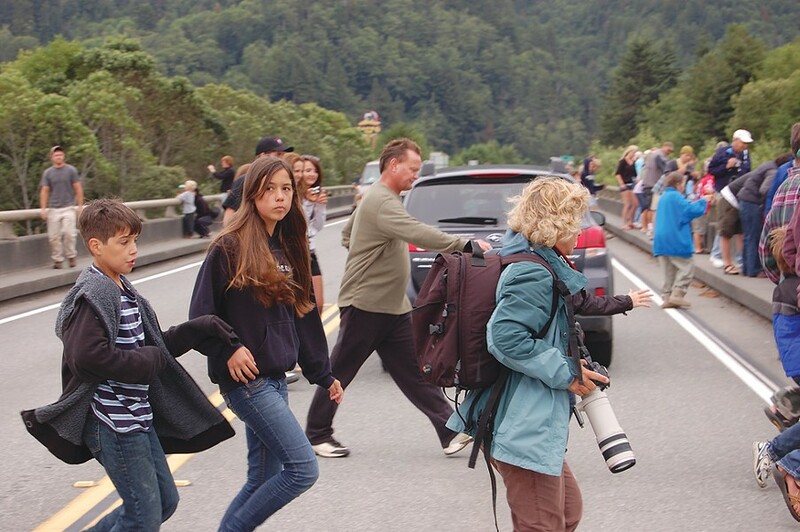 As cars whizzed past, an ever-changing line of faces -- as many as 200 at a time -- stood on a person-wide “sidewalk” and peered over the railing of the narrow two-lane bridge while the whale swam back and forth under the bridge. Despite the urgency in the boats below, people above were enjoying the show. It was a more depressing version of the one earlier in the week. The Wednesday before, with both whales together in the Klamath, the colorful display from the bridge had been much more pleasant and “ahh”-inspiring. Man, you shoulda been there. Summer sunshine warmed and sparkled the boat-free waters below as mama and baby slowly, playfully and adorably made their side-by-side, destinationless way to nowhere. People smiled. Children laughed. Somewhere in the distance, a unicorn slid down a rainbow. But Sunday’s overcast gloom added to what could have been perceived by the bridge gawkers as the disheartening bummer of a now childless mother in apparent confusion, too stubborn to accept help from people with her best interests in their hearts. Before she swam up the Klamath River last month, her baby snug by her side and the heavy pumping of her deeply V'd tail flukes leaving a trail of water dimples on the surface behind her, Gray Whale No. 604 had not been seen in California. Since 2001, the first year she was noticed by researchers and had her ID photo snapped for the official catalog of gray whales, she'd been spotted several times in the Pacific Northwest, said Pat Gearin, a Seattle-based research wildlife biologist with NOAA's National Marine Mammal Laboratory. "She's been seen in Washington state several times and off Vancouver Island at least a dozen times," Gearin said by phone Monday afternoon. "I saw her myself off Kodiak Island in 2005." 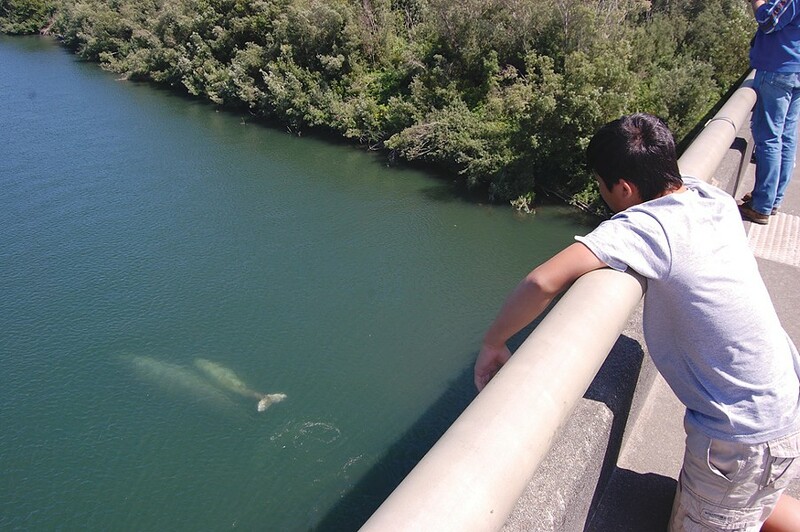 It is uncommon for a gray whale to swim into a river and hang out there for more than a month. 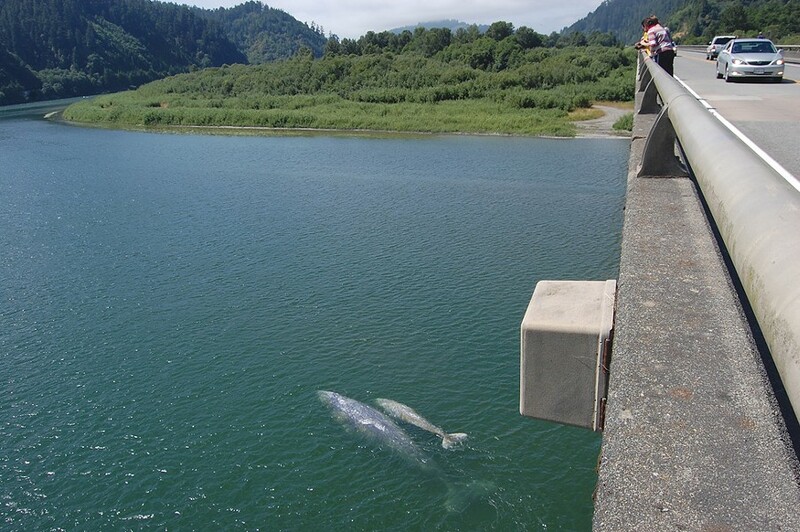 But it turns out it's not that unusual for a gray whale to be hanging around in the ocean in this part of the world this time of year, researchers say -- contrary to recent news reports that our Klamath River visitor "should be in Alaska by now." About 18,000 to 20,000 "eastern-stock" gray whales live in the eastern part of the Pacific Ocean, generally traveling between Baja and the Arctic. (By comparison, there are fewer than 100 endangered "western-stock" gray whales, which ply the western waters of the North Pacific off the coast of eastern Asia.) Most of the 18,000-plus eastern stock grays spend their summers feeding in waters north of Alaska, in the northern Bering and Chukchi seas and the Arctic Ocean. About 200 or so of them, however, don't migrate that far north. Instead, Gearin says, they disperse between southeast Alaska and California, wherever the food is abundant, and linger there from spring through fall. Around October, they begin to migrate south, along with the rest of the gray whale population coming down from the north, to spend roughly December to February in their breeding and calving grounds in the lagoons off the west coast of Baja in Mexico. Gearin and other researchers have been studying this "Pacific Coast Feeding Group" for about 15 years, and what they know so far is that there is no individual loyalty to the group -- that is, some years a particular gray whale might go far north, while other years it might stay with the group that researchers call PCFG. "I've done some surveys up by Kodiak Island, and we found that about 22 percent of the whales we observed in Kodiak matched with the PCFG" whales observed in other years, Gearin said. "They don't occur in just one area. They can show some site fidelity to certain areas -- if they've learned there's food there, they might return the next year." 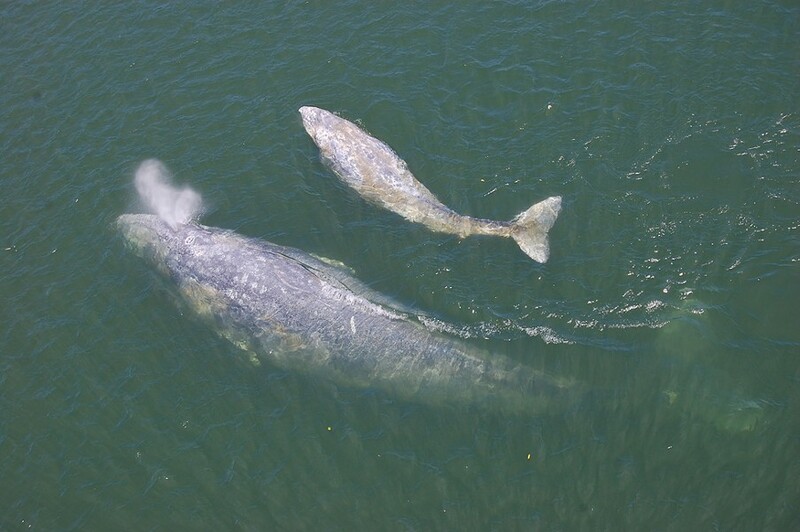 Female gray whales, especially, are hungry when they begin their northern migration, after 12 to 13 months of gestation and another three to six months of fasting in their Baja lagoons as they nurse their newborn calves. "My working hypothesis is they search for food on the way north, and if they find food somewhere, if there's plenty for summer, they'll stay for summer," Gearin said. "If not, they'll move north and look for food along way, continuing north until they find it." Gray whales are baleens -- they don't have teeth but instead filter ocean water or sediment through bristles that capture food. Some baleens filter plankton from the water. Gray whales, the only species (robustus) in their genus (Eschrichtius) and the only genus in their family (Eschrichtiidae), are different. Their baleens are shorter and coarser and often used to bottom feed when they're in bays and lagoons, or even temporarily in rivers. There, they'll tip on their right side, dive and scoop up bottom sediments to capture small marine invertebrates and tiny sand-flea-like creatures called amphipods. In the open ocean in the Pacific Northwest, Gearin said, gray whales do less bottom feeding and tend more to slurp up dense swarms of mysid shrimps, each a quarter- to a half-inch long, from the water column. Gray whales are different in other ways too: They don't have a dorsal fin -- just a hump, and then a series of knuckles (bumps) down to their tail flukes. It's probable that whale No. 604, rather than being way behind the migration schedule, is simply with the PCFG this year. So it isn't that unusual to see her. But Gearin said he was surprised to see she still had an unweaned calf with her. "It's getting kind of late in the year," he said. "Most of these whales should be weaned by now -- in May, June. It's a strong possibility they got spooked in there; why would they be there a month? That tells me either there is something wrong with the calf, or they're afraid the river's too shallow to go back downstream, or they're still spooked." He speculated a killer whale could have frightened the pair. Dawn Goley, a professor of zoology at HSU, said the female whale has what appear to be killer whale rake marks on her. But in a phone interview Monday, Goley, NOAA marine mammal biologist Monica DeAngelis, and Sarah Wilkin, NOAA's marine mammal stranding coordinator for California, all were reluctant to guess what had caused these whales to swim into the river. Whales are known to go into the mouths of rivers for other reasons, particularly in search of rich feeding areas. Generally, they don't linger this long. "There are a lot of theories,” DeAngelis said. "Nobody observed them coming into the river," said Wilkin. Nobody saw the calf leave the river, either, although DeAngelis was one of the people who saw what might likely have been the calf in the ocean. "On Saturday, about 5 p.m., we saw a small animal curving around the mouth of the river, heading north," DeAngelis said. "It was about the same size as the calf and it had some brown on it that looked the same as the algal growth on the calf seen in the river. We saw it surface and blow, then we lost it in the fog." Goley and her graduate students have been studying the gray whales that hang around our stretch of coast ever since another one wandered into the Klamath River in 1989. In fact, although Yurok people have frequently seen gray whales here this time of year, that 1989 episode was the first time researchers realized some gray whales don't go all the way north to feed. Also by phone on Monday, Yurok Tribal Heritage Preservation Officer Bob McConnell said he remembers that whale of 1989. "It was about 25 feet long, and they nicknamed it Bubbles," he said. "I was fishing at the mouth of the river and it basically just came in, and then it left within a matter of hours. Then it came back in. And it did that again and again for about a week. It swam right through the fishing nets." The Yurok have never hunted whales, but they do figure into the tribe's history. McConnell said there is a Yurok story of a whale that lived in Fish Lake, way up in the Siskiyou Mountains in a very spiritual location. In those mountains there is an imprint of a whale on the ground, said Yurok elder Walt Lara Sr. by phone on Monday, just after he'd driven over the Highway 101 bridge and seen the whale rise up and spout. "Whales to us are almost like humans," he said. "A long time ago, our community of people were tuned into that and would sing to them. And when they died and washed ashore, they didn't go to waste. We would cut them up and give the pieces to people in the community. ... To us, a whale in the river is a good thing. It is a spiritual move that says, 'You people are doing things right.'" Little is known about Gray Whale No. 604, other than where she's been sighted. She's an adult female, of the usual full-grown size of 45 feet and a presumed 40 tons. Her age is not known -- gray whales are thought to live 50 to 70 or so years, although not enough research has been done to pin that down. Unlike, say, orcas, some of whom have been tracked since birth, little is known about the gray whale life cycle, said Gearin. On Monday, amid the noisy chaos on the river, scientists used a crossbow to shoot a tiny device into the female whale to get a pencil-eraser-sized plug of skin and blubber. It's been sent off to a lab, said Gearin, where they're analyzing it to assess her general health and her genetic identity. The genetic testing will be used in a study trying to distinguish genetic differences between feeding groups in the Pacific Northwest. Whale No. 604's calf was about 15 feet long and somewhere between 5 and 8 months old, researchers say, judging from the time most calves are born. Normally, gray whale calves will wean between 6 and 8 months old -- and when they leave their mother, they're gone, said Gearin. And they're vulnerable. "No one's actually done a weaning study of this species," Gearin said. "We've often seen ones 6 to 8 months old that are alone. And, like other young marine mammals going out on their own, they're poking around, not knowing quite what to do. Like harbor seals -- that's why we see a lot of starveling pups." Gearin said Whale No. 604's calf might have been only 5 months old. "To be quite frank, I don't think its chance of survival is going to be too great," he said. "It had been up in the river for a month. And it's an anomaly to see these large whales in a river for that long. There's not enough food, and the female probably wasn't nursing it as much as it should." Moreover, gray whales are not social, group-oriented animals with filial bonds, like killer whales and dolphins. They're generally solitary, said Gearin. The calf would likely be on its own. Unless, said Gearin, sensing a need to end on a not-so-bleak note, the calf was really only 5 months old and not ready to actually be weaned. In that case, its mother -- if she leaves the river -- could find it once she is in the ocean, and continue to nurse and protect it for awhile. In the days before the palpable urgency to shoo the whales from the river took hold over the weekend, the excitement generated by a gray whale and her calf in a ridiculously viewable stretch of river led to all-out whalepalooza! 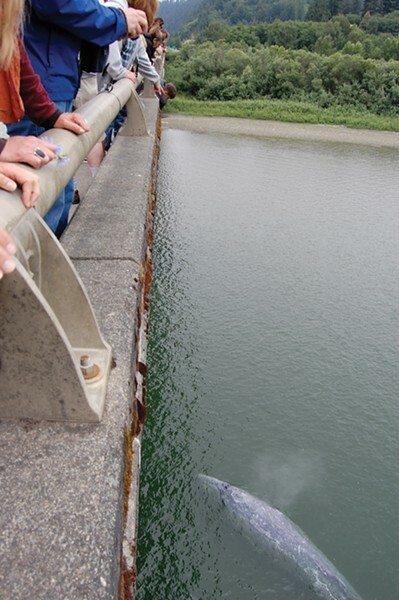 While perhaps a headache for law enforcement trying to keep traffic and people on the bridge in check, those who were lucky enough to witness mama and baby together were hypnotized by the whale’s every move. They’re goin’ under! And with that the crowd -- almost acknowledging the peak summer tourists whizzing by in their cars and RVs -- cautiously but hurriedly scurried in Frogger-esque fashion to the other side of the bridge so as not to miss one second of cute. They’re goin’ back! The whales made a surprisingly nimble, sharp turn and -- like watching a crowd of heads swivel in unison at a tennis match -- a mirror image of the scene above replayed. “Don’t run in front of cars!” Rachel Zhao of San Jose yelled at her teenage son Jiachen as he dashed across the pavement to be the first to catch what whales looked like on the other side of the bridge. “I’m fine,” he replied, already in a whale-induced trance. 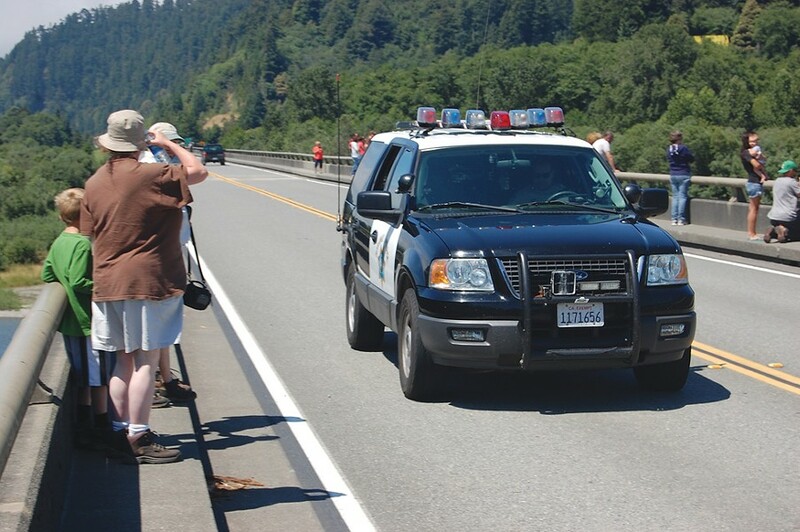 “Please, watch for traffic,” Yurok Tribal Police Sgt. Thorin McCovey echoed patiently for the umpteenth time from a loud speaker attached to his patrol vehicle. For almost the entirety of their time in the river -- nearly a month now -- the whales had been in a stretch of the river about a half-mile downstream -- three miles from the mouth of the Klamath -- next to the less-traveled Klamath Beach Road. Today, for the first time, they’d moved to primetime. Flares were lit on either side of the bridge to slow traffic. One car was ticketed for stopping on the bridge. But law enforcement, more than anything, wanted to accommodate curiosity. “We weren’t going to rain on anyone’s whale watching,” McCovey said. Most of those who stopped had not engraved “whale watching” on their itinerary. But on busy highways, crowds begat crowds. Cyclist Eric Ferrante was on his fourth consecutive 100-mile day on his trek from Stinson Beach to Seattle. In an attempt to maintain his distance goals he hadn’t been taking many extended breaks. But when he saw the gathered masses he made a whale exception. “You kind of have to stop for something like this,” he said. Of course, there were those classic humans who were underwhelmed. Some less-than-impressed eavesdropped sentiment from the roadside attraction: “They’re not big enough.” Or, “I wish they’d tip a boat over.” In reference to Sunday’s attempts to drive out mama whale: “I wish they’d stop that banging!” And who could forget, “Where are the bathrooms?” Thanks, crew. Lynne Gaither of Clarksville, Md., assumed that people had stopped to take in the golden bear statues at the end of the bridge but was pleased to discover the real reason. 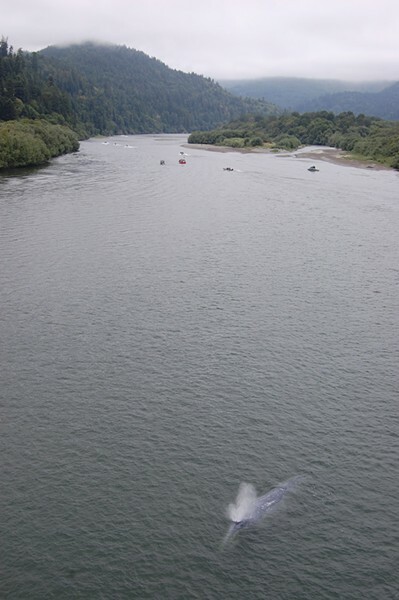 “Absolutely breathtaking,” she said of the surprise visitors, “I wonder if she knows how beautiful she is.” As she pondered, the daily Klamath River Jet Boat Tour appeared from the east, causing a stir from people on the bridge. 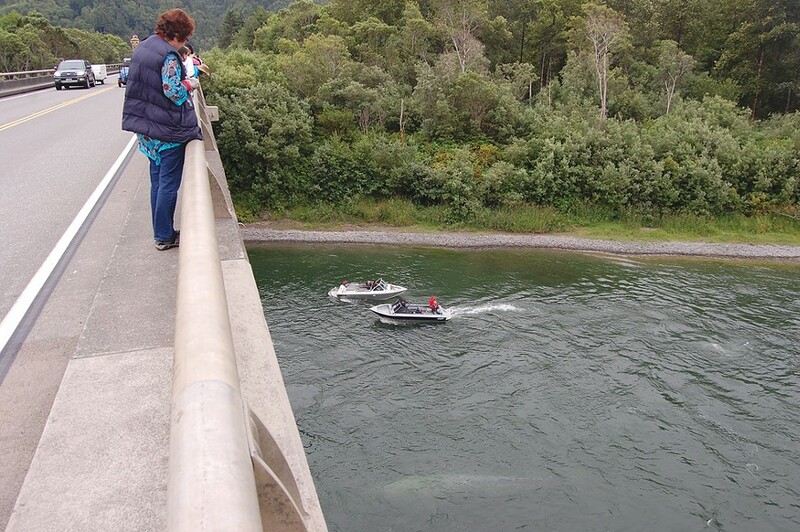 The boat slowed as it approached the bridge and Gaither, unaware that the whales' presence had been known to locals for weeks, called down, “There are whales over there!” pointing to the west side of the bridge. “That’s what they paid for,” a smartypants on the bridge chimed in. 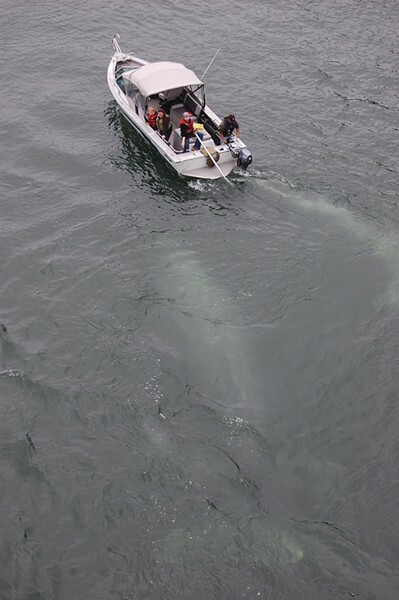 The boat idled by the whales without incident. Klamath River Jet Boat Tour representative Jan Mossholder said that her company has seen a slight increase in business but that most tourists who sign up for their tours are unaware of the whale presence. Federal law as outlined in the Marine Mammal Protection Act states that boaters must remain at least 100 yards away from animals unless approached by them -- which they tend to do. “They like to come up to the boat,” Mossholder said. Perhaps less savory were attempts to prosper from the whale-watching experience itself. 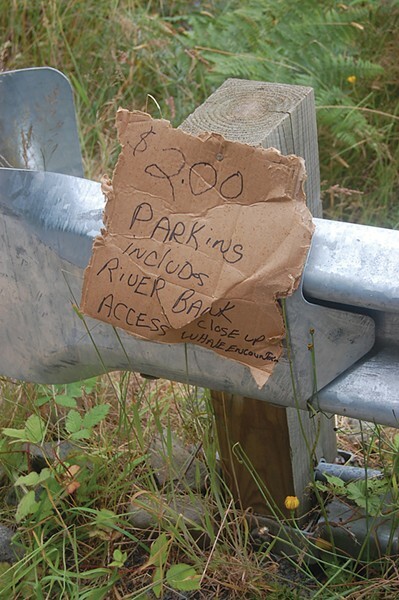 Earlier in the week when the whales were less accessible farther downstream, a cardboard sign nailed to a railing that lined an overlook beside the road read “$2.00 PARKING -- INCLUDES RIVER BANK ACCESS -- CLOSE UP WHALE ENCOUNTER” in scrawled Sharpie. 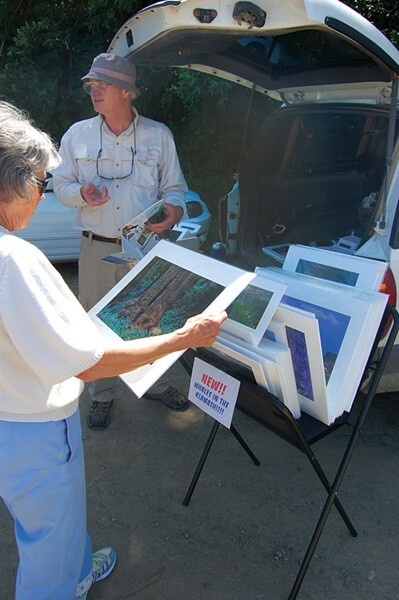 Jack Filmer, who runs the Klamath River RV Park about a half mile up the road, suspects the sign posters to be the occupants of several sketchy-looking trailers parked across from the overlook. With interest in the whales high, Filmer made the decision -- partly because of liability issues and out of concern for his paying customers -- to charge $7 to allow whale watchers access to the river side located inside his RV park. But he does not believe anyone who just tacks up a cardboard sign should be profiting from the whales. "They have no right to charge anyone for anything," he said. On Tuesday, researchers returned to the river with a new tactic: They broadcast killer whale feeding calls in the water, which they hoped would trigger a switch in Whale No. 604's brain and urge her oceanward. At first the gray whale reacted to the predator calls just as researchers had hoped, said zoology professor Goley. "She responded by having longer dives and moving downriver," Goley said. "Then she started making shorter dives and coming into shallow water, making subtle blows, slinking along the shore." After that, she reverted back to her usual nonchalant behavior of hanging around the 101 bridge. "Now we are going to wait for a few days, let time tell," she said. "One hopes that, now that we’re gone with the sound, she will sense the river is free of the predators and hightail it out of there. We feel now we’ve exhausted all of the tools." Biologists will monitor the whale, and the river, and if conditions worsen and the whale doesn’t leave, they’ll make a new plan. Matt Mais, spokesperson for the Yurok Tribe, said the tribe also was working on a plan in case the whale doesn't leave. Fishing season would begin as scheduled. But if the whale starts heading for the mouth, fishermen would haul in the nets. And if she got stranded by shallow water? Nobody had a plan for that yet.